"Certain marks of colonization are still manifested by the people. I have arbitrarily identified these marks as dependence and subservience." We Filipinos tend to have "balat sibuyas" whenever a criticism, constructive or not, is made. And we tend to employ "argumentum ad hominem," to attack the person instead of addressing the issues raised, to see the messenger and not the message. Such is oftentimes our reaction to friends and/or foes who speak their minds or we simply hate the unpleasant truth. We do the same when we are a loss of what to say and just do not want to admit so. The social analysis about us Filipinos made by James Fallows (Rhodes scholar/Pres. Jimmy Carter's chief speechwriter/National Correspondent of the Atlantic Monthly) has so much truth in it. His 1987 article has been included and updated in his 1994 book "Looking at the Sun," a book about the whats and whys on the great economic growth of our Asian neighbors and our being left behind. "Individual Filipinos are at least as brave, kind and noble-spirited as individual Japanese, but their culture draws the boundaries of decent treatment much more narrowly. 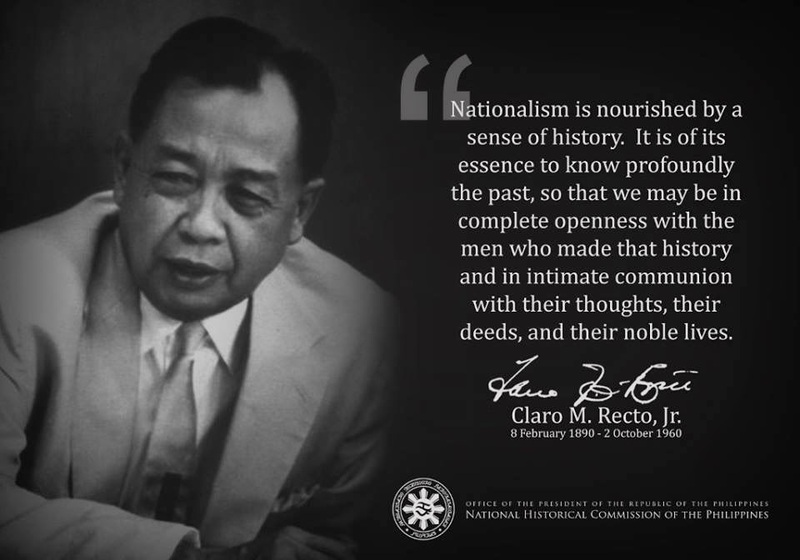 Filipinos pride themselves on their lifelong loyalty to family, schoolmates, compadres, members of the same tribe, residents of the same barangay ... Because these boundaries are limited to the family or tribe, they exclude at any given moment 99 percent of the other people in the country. Because of this fragmentation, this lack of useful nationalism, people treat each other worse in the Philippines than in any other Asian country I have seen ... The tradition of political corruption and cronyism, the extremes of wealth and poverty, the tribal fragmentation, the local elite's willingness to make a separate profitable peace with colonial powers--all reflect a feeble sense of national interest and a contempt for the public good." We were shocked and angry, insulted by this foreigner who deigned to analyze our culture like he knew us. He was called names, the worst of which was a "parachutist," which referred to foreign correspondents who flew into the country on Sunday, looked around Metro Manila on Monday, flew out of Tuesday, and published an "in-depth" story about us on Wednesday. We met up with a lot of such enterprising journalists in those days, when the Philippines was the darling of the West and stories about Philippine politics were snapped up by editors who could not get enough of our peaceful transition from dictatorship to democracy. How dare he, many Filipino commentators bristled at Fallows' arrogant assessment of Philippine society during that honeymoon period. His judgment stung--"lack of useful nationalism", "a feeble sense of national interest"--being the worst of all. But what stayed with me was his observation that "people treat each other worse in the Philippines than in any other Asian country I have seen..."
Recently, local commentators, despairing over the bad and ugly politics that have engulfed us in the run-up to the 2004 presidential elections, have dug up their fading copies of Fallows' essay for a closer reading. And they are seeing that the mirror he held to our faces in 1987 may have been accurate then, and is certainly accurate now. Just observing the Philippine Senate-traditionally been the breeding ground for Presidents- holding a public hearing for ten minutes, we see the worst possible example of tribal fragmentation among the local elite. Administration and opposition senators regard each other with undisguised distrust and disgust, and treat their witnesses-invited guests, if you will--even worse. When the senators cannot get them to dance to their partisan tunes, they call them liars and obstructionists, put words in their mouths and threaten them with contempt and detention. With kid gloves off and cloven hooves and fangs showing, they gnarl and leap at one another, as well as at anyone whom they wish to bully to follow their line. All the while, of course, they are protected by parliamentary immunity from anyone who wishes to fight back. Such public displays of meanness and uncivility over national television by our supposedly "honorable" senators add nothing to the Filipinos' sense of national interest or pride in their country and people. They only drive home Fallows' point that in this country, we draw "the boundaries of decent treatment" very narrowly, limiting them to the family or tribe, and truly excluding 99 percent of the other people in the country. In 1971, Fr. Pacifico Ortiz SJ, in an invocation at the opening of Congress, described the country as trembling on the edge of a smoldering volcano. Well, 32 years later, we are back on the edge of that volcano, which goes to show that we have learned little-if anything - in the last 32 years. Perhaps we never really left the edge; the volcano just dissipated for a while when the dictator departed, and we mistook the restoration of the trappings of democracy for the fundamental changes we needed to implement. But as it turns out, we have only marked time, wallowing in a culture so damaged, it has, as James Fallows so astutely observed, stood in the way of our development and has made a naturally rich country poor. The Philippines, wrote Fallows, describing the situation here, is "a society that has degenerated into a war of every man against every man." Recently, the bishops and priests spoke from the pulpit condemning graft and corruption and the life-sucking dirty politics that our daily lives are mired in and distracted Congress from its task of legislation and the Government from governance. Newspapers are raking it in with paid advertisements from sectoral groups and NGOs pleading with the administration to act on the plight of the poor and powerless, with supposed coup plotters to abandon their destructive ambitions to rule the country by military force, with politicians to set aside their partisan agendas and focus on the larger picture, and with the media to help set a forward-looking agenda for the country, and not be content to merely reflect the mire it is in. The paid advertisements are starting to become news items themselves, especially for a people used to getting their information from reading between the lines. The call of the hour is for everyone to think outside of themselves and consider the country, the people, our children, and--as the visiting Thai Prime Minister Thaksin Shinawatra told Filipino businessmen on Monday--think of the next generation. Thaksin seemed to be talking about the ruinous politics in the land when he told the business leaders the difference between a politician and a statesman: "A politician always thinks about the next election," Thaksin said, "while a statesman always thinks about the next generation. If you think about the next generation, then you can do a lot of change." Painful as it is to accept the image of ourselves that Fallows has confronted us with, it is time to give it serious thought and action. Nothing else --not self-praise, not self-flagellation, and not those occasional spurts of national pride-- has made us the nation that we ought to be by now. We might start by making James Fallows' essay on our damaged culture required reading for every member of Congress and the administration. And to make sure they understand it, maybe we should commission an illustrated-comics version. I am a Filipino but I have long passed that stage of being a balat sibuyas. The best attitude for every Filipino is taht rationally critical and eclectic approach to any problem besetting us. There is a book that may explain the Filipino intellectual psyche- Envy: A Theory of Social Behaviour by German sociologist Helmutt Schoeck. This book is a must reading for all Filipino intellectuals who had difficulties passing Math 11 and/or Philo 101 in their college years. I agree with your first paragraph about thinking critically and adopting an eclectic approach to problem-solving and the like. One does not have to read a book on envy, it's explained and part of our human nature. What we need is to be consciously aware of its presence and to direct it to a more cosntructive and productive in personal and societal pursuits. Lastly, I do not see the relevance of your schoolboy statement re Math 11 or Philosophy 101. Though not claiming to be an intellectual, in case you consider me one, note that I am a registered chemical engineer with an MBA from UP. I also dabbled in MA Philo at UP but found it much into linguistics and useless (maybe not completely if I were to be into rhetorics). Well what the hell. Am just trying to be petty here. I have to agree with you that many Filipinos(not all) are balat sibuyas. How we love to criticize other countries(the US especially) for their own flaws but when we are in the hot seat, we get mad. If there weren't a grain of truth to Fallow's article, then it would have never become controversial.